A Bird Hunter's Thoughts: To Trailer on Not? When I started traveling to hunt around the country, I used to get all my gear, dogs, guns and stuff in the pickup. Dog crates jammed in the bed of the truck, clothes and guns stashed in the backseat- I looked like a member of the Clampet's on the way to California. We'd laugh at the stack of stuff tied in with the dog crates and food buckets and water cans. 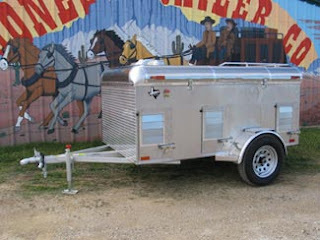 About 6 years ago, I finally broke down and decided it was time to get one of those fancy dog trailers. I'd been seeing a lot of them at the NSTRA trials. The big boys would roll in to the area dragging fancy trailers behind their motor coaches or big diesel trucks. Those dogs had is good- living at the Ritz! I looked at Cabelas and Bass Pro and online, too. I asked a few of the "big boys" what the best trailer was and, without exception, it was "Jones". (http://www.jonestrailers.com/) I compared prices for about a month with all the folks I could find on the net. While Jones trailers were higher upfront, when I started adding up all the features to get other trailers comparable, the Jones many times was cheaper. They are custom made to order most times- mine was stainless steel, 6 holer, with fan and water. I really like the safety aspect, too. They make no bones about the fact their trailers protect your dogs. I have 3 bird dogs, so I figured a 4-holer would be perfect. When I talked to the Jones folks, they told me they'd sell me what I wanted, but they recommended the 6 holer. "No one ever brought back a 6 holer and said it was too big, but we get pleny of 4 holers brought back for being too small. Seems like bird hunters always pick up the dogs of their friends and hunting partners, too, so you gotta factor that in!" Oh, how right he was! I fill this one up all the time. So I packed up the old F-250 and drove to Woodson, TX to get my trailer- made it right at 5:00 pm in one day, too. I hooked that trailer on the back and headed home. It drives so well, I have to conciously remember that I have it on the back. I can haul everything I need for extended trips in that trailer and I'm convinced it is more comfortable for the dogs, too. Now, these trailers are the best on the road, in my opinion, and those folks in Woodson, TX are real proud of them, too. But the re-sale is very high, also. I recommend them to you.